The production of hair is not continuous one, but instead occurs in cycles. The growth phase is known as Anagen, followed by the transitional, regressive phase Catagen, and then the resting phase of Telogen. During the relatively long Anagen phase, which lasts for 1,000 days or 2-5 years, the matrix cells divide, become keratinized, and hair is produced. The Catagen phase lasts for about 2-3 weeks and is of little importance. During the Telogen phase, which lasts for several months, the cell division stops, hair growth ceases, and the attachment of the hair to the base of the follicle becomes progressively weaker. Finally, as a result of ordinary traction, whether it be from combing, washing, the hair’s own weight, or a push by a new, emerging hair, the old hair is eventually shed and discarded. A smaller percentage of women ages 30 to 60 may notice a thinning of the hair that affects the entire scalp. The hair loss may be heavier at first, and then gradually slow or stop entirely. This hair loss usually develops gradually and may be patchy or an overall diffusion. 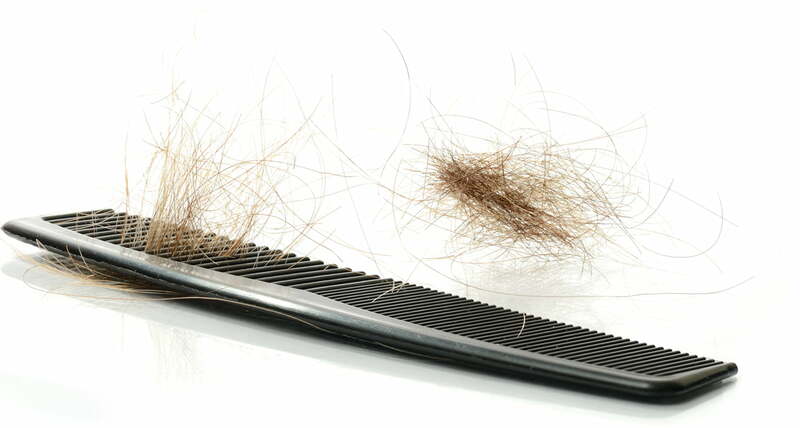 The average person loses about 100 hairs daily from the approximately 100,000 hairs their scalp contains.